This is on an 11x14 canvas, if I remember correctly. The gorgeous hairpiece, dahling, I decided would be best created by using the edge of a palette knife. I have only laid in the golds and yellows, and still need to add more "glow" and dark rings around the quills. I'm going to wait to see whether and what I will do for the background. This has been so much fun to paint. We hosted two much-anticipated events at LibertyTown on Friday. In the morning, students from a local school came as the culminating event in their wonderful arts in residence program for their 4th and 5th graders begun by LT artist and their art teacher, Mirinda Reynolds. Mirinda asked me to do a workshop on printmaking with them, taking each of the four classes one at a time. The other group did a tour and scavenger hunt through the facility while they waited their turn to get messy! After the kids went on their picnic to a local park, we scurried around getting spiffed up and moving things around to get ready for our Big Event from our May Patron Show Fundraiser. Our idea to raise money to support LibertyTown was loaned to us from our friends up the road in Alexandria at The Torpedo Factory. In a nutshell, here's how it worked at our place: 1) local and regional artists donated artwork; 2) the same # of tickets were sold for $100 as pieces donated; 3) a random drawing was held on Friday night and each person who had bought a ticket got to pick their favorite piece from the items donated. It was great fun. Everyone who bought tickets went home with great pieces of 2d and 3d artwork at a bargain price. Someone said to me, "I hope you will do this again next year. I'm going to buy 5 tickets!" Even people whose ticket didn't get drawn until close to the end sometimes had their 3rd or 4th choice still available, given the variety of work given and the variety of artistic tastes there are in the human mix. The couple with the next to the last ticket picked went home with a wonderful Dan Finnegan vase filled with beautiful hand-picked flowers in addition to their artwork, and the last ticket in the basket not only got a wonderful piece of mixed media art, but gets the first pick next year, if they decide to buy a ticket for Patron Show, the Second! And I forgot to say, that Cathyann Burgess stopped by for another visit in the middle of all the preparations, so we did not get to go for coffee, this time, but we did get to chat! She's a great lady and creative artist. Check out her blog. I'm signing out for now, but before I go, you know I have one last word! Thanks to all of you who make comments on my posts. It enriches my life and art, and I appreciate it very much. Also--welcome to my new followers. Thanks for joining! What a slug I was over the weekend! I needed to shut down for a while, I think, after my parents' wonderful visit. Even yesterday I just wandered around in my studio, moving things around, not sure what to work on. But today, I finally got back to some discipline about working. What fun! I finished these two pieces. I also did some refinements on a commissioned work. On that subject, I've just about decided that I'm not going to accept any more commissions when I am done with this one. I don't think I am suited to them. My creativity freezes up. I don't read minds yet, and until I do, I will never know what it is someone is thinking when they ask me to paint something for them. Can they not see my work, see my style, use of color, etc? If they want a picture painted in another style, they will need to ask another artist to do it for them from now on. There, I said it! Another artist, who does lots of commissioned work, said recently to me, "If you aren't willing for the buyer to go home with something they may not be completely happy with, you shouldn't be taking commissions." What do you all think? Any helpful advice or input here? ...the beginnings of the first layer of a new collage/painting (24 x 30) in my series: Birds You Won't Find in a Field Guide. I have a student (a talented interior designer by day) who is interested in the way I do this tortuous under-painting method, so I started this painting to demonstrate. She began her own yesterday. Her collage is beautifully done with carefully chosen papers in coordinating colors. I'm not entirely sure I'm going to be able to convince her to paint over it! Nobody said art was easy. A friend of mine let me use some of her photos of flamingos that she took while in Phoenix. These are relief prints using a soft block material and water soluble printmaking inks. My apologies to the individual bird as I do kind of put my own "stamp" on the work I do--heh. I printed a few (black ink) which I mean for framing, and the colored ones will be sold as cards in my shop at LibertyTown. Just quickly, in the middle of the night, a couple of pieces which have needed something to make them work. Collage is my answer to most anything..."What is the meaning of life?--Collage!" "What shall we have for dinner?--Collage!" You fellow artists know how it is! These are both, most definitely, works in progress. I had a wonderful surprise on Friday. Cathyann stopped by my studio to visit while on a trip to Fredericksburg to drop off work for a regional art show. I was in the big middle of doing some challenging teaching, so I couldn't stop and have a comfortable chat as I wanted to, but it was great to meet a blogging friend in person. Thanks for coming by, Cathyann. Perhaps coffee next time?! I'm not sure whether you'll be able to tell, but I did add collage to the egrets and repainted them. I think I have achieved my goal of making them more prominent in the composition without diminishing the impact of their friend. I'm hoping to make art today. I'm needing to get some writing done for the board I sit on before my parents get here!! Bless them for making the effort to come visit--we're excited--and finally ready. On the subject of family and Mothers' Day....I had the best one maybe ever. My 20 year old son brought me flowers and a mushy card on Sunday, and then took me out to dinner last night! My younger son gave me beautiful washi earrings folded like butterflies, and my husband cooked a delicious dinner and brought me orange and yellow tulips. Life is good! I sold a painting at Art at the Mill! And guess what? It was a bird! Where has the time gone? I have been painting and cleaning house and all of a sudden days have gone by with no post! Special guests are coming to my house, and my posts will be less frequent for a while, I suspect! This painting is one for my show. I have decided, with the counsel of my critique buddies, that it needs collage elements to be more in line with the other work. I think it will create more focus on the birds, which is supposed to be the unifying theme of the exhibit. So that is my job for today. 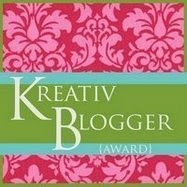 I have unfinished business with Saundra Lane Galloway who most generously gave me the Kreative Blogger award. Her work in painting and collage is wonderful and, on top of that, she is a warm, supportive member of the community of artists who blog. She paints and creates prolifically, and lately, has taken to making works of art she calls "Eye Candy." They are pieces that do not necessarily fit any other series or challenge she routinely does, but are done just for FUN. (If ART can't be fun, I don't know what can) I have been really lifted up by her comments and by this award. Thanks so much Saundra! 2) Link back to the bestower of the award and list these rules in your post. 3) Name and link to seven deserving blogs to receive the award next. 4) Let them know they've been tagged. 1. My supportive husband who never asks how much something costs or whether I'm selling anything, but always says, "Go for it!" 2. My boys, who act like their mom is cool for being an artist. 3. The best family in the world. 4. Having found this great online support system where I can interact with and see incredible art from people who live all over the world. 5. That Spring has sprung, and warm weather is here. 6. Being able to be a part of LibertyTown Arts Workshop and for all the wonderful friends and fellow artists there. 7. A wonderful church family and a great community to live in. Go visit Saundra's blog (see link at the top of this post) and all the other artists that she follows. They are truly inspirational. I will ponder all these things in my heart and pass along the award to seven other blogs in a post which I hope will be later today! Almost done--needs tweaking here and there. Yesterday was a very productive day. I did get started on those yellow m & ms, and I hope, despite all the rain we've been having that the painting is dry enough to begin working on the next layer. I'm working in oils on a wood panel for that one. After coming upon me painting my second ostrich painting this week, Dan asked me, "Do you have a particular thing about ostriches?" I said, "No, about birds..." But the more I've thought about it, ostriches look like family to me. And then I remembered this poster my brother brought home when we were teens which showed a herd (gaggle? murder?--anybody know?) of ostriches, many with mouths wide open, which had as its caption, "When all is said and done, there's a lot more said than done. " It seemed to fit our family dynamic, and we were aware enough of that to find it funny. So, maybe I do have a long-buried affection for ostriches. 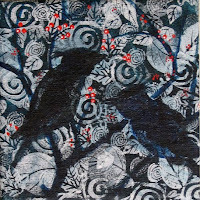 This image is of the canvas with its midnight blue under painting still showing in the shape of the birds, with collage all around. I had first drawn the three ostriches in watercolor pencil on the toned canvas. Next, I began to detail the birds and fill in the background scene. I will endeavor to work more on this today, plus I've prepared other canvases. Then, there are these couple of commissions that are lurking around. One is very fun--yellow peanut M &Ms. Man, I love my work! I have tried several times but can't get a very good photo of this block print of my friend on his way north, migrating for the summer. It must be hard to leave those tasty cocktails behind. I worked up the drawing and cut the block on Saturday. Here's what I worked on today. I had planned to paint a rhea, but along the way it turned into more of a "duckish" creature. Funny how that happens! I'm throwing a happy party! Yesterday was a good day for the pocketbook. I sold two paintings in my studio at LibertyTown. Welcome to new followers! Thanks for checking in and joining my blog. I'll try to make you smile now and again. This is the piece I wasn't sure I was ready to show, but I didn't take a photo of today's work, so here it is. The birdies need touching up here and there, but I am really pleased with the feel of it. It is on a 10 x 16 canvas and painted in acrylic over collage. I put my head down and painted today. This is a bitty one, 5" x 5" in real life. It is unfinished, but I like what is done so far. This is another one with acrylic paint over collage. I surely do like that combination of media--so fun! I did paint a larger one today as well, which I'm pretty excited about, but it still needs some refinement, so I will wait to reveal it. How's that for a teaser?